We would like to thank Hope House Mission in Middletown for allowing us to join them and serve a meal at the men’s shelter last night. Also, a big thanks to Central Connections for preparing the delicious meal! 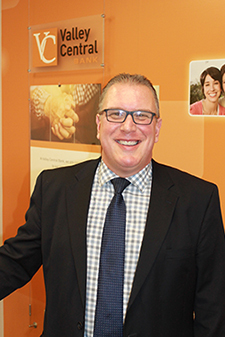 When our community thrives, so does our bank. We are tied together in many unique ways. The Valley Central team is very active in the community and shares leadership and support roles with our customers and friends, alike. There are hundreds of exceptional charitable organizations and groups all working to make a difference through applying efforts in their passion. Our team supports many of them with time, talent and treasure. We are proud to share a list of organizations that the Valley Central Bank team worked with, volunteered for, financially supported and cheered their success in 2018. Valley Central Bank would like to thank Central Connections in Middletown for welcoming our volunteers and allowing us to lend a helping hand with their 50's and 60's Rock and Rock-A-Billy Senior Dance last Thursday night. We enjoyed connecting with people in our local community and loved watching everyone have a great time! We look forward to our next visit with Central Connections! Valley Central would like to thank the volunteers who came out to Lakota East High School on Saturday for the Special Olympics track and field day! We had a great time. Sometimes a chance meeting is all it takes to find a Hero. That’s how it was with Ron Hotchkiss, Vice President of the Liberty Township branch of Valley Central Bank. In late 2016, Ron attended Chamber meetings in Fairfield and Hamilton at the same time as Easterseals’ Business Development Manager, Jill Cates. Jill was seeking community partners for Easterseals programs and when she described the Neighborhood HUB program, Ron took immediate interest. And the rest, they say, is history. Neighborhood HUBs offer individuals with disabilities a neighborhood-based location from which to spend most of their day, gaining total immersion and integration into the community, as well as greater access to work, training, education, and social and recreational opportunities. This idea of community-based programming was very appealing to Ron because Valley Central Bank is a community bank. Prior to July of 2015, the bank had only one location in Reading. 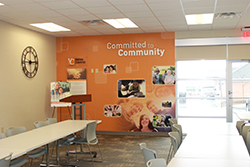 The Liberty Township location is its first and only branch, and it even has a 735-square-foot community room with a kitchenette, which can be reserved by anyone in the community free of charge. With these community-focused ideals so prevalent in his life, Ron approached Jill and asked how he could be involved in the HUBs. They realized that with his background, it would be useful for him to teach basic finance. But Ron wasn’t sure how he would do it. He had a lot of experience volunteering in local schools, but he was a little worried that teaching adults with disabilities would be a completely different dynamic. So the class developed in an improvised, free-flowing manner. They talked about the things that a bank does to prevent being robbed, which led to discussing security and being aware of your surroundings. They discussed needs versus wants and how to build savings. And since Valley Central Bank does a large amount of business lending, Ron often discussed process of taking an idea for a business and making it a reality through loans. Some concepts were revisited multiple classes in a row, and others would stick right away. The HUB even made a field trip to the Liberty Township branch, where staff was warm and welcoming, and everyone enjoyed a pizza lunch together. The personalized slideshow that was greeting them when they arrived was an unforgettable highlight for many of the participants. Though the formal classes have ended, Ron continues to give. Ron’s branch has made plans to volunteer as a group at the Easterseals fundraiser, ReUse-apalooza!, in May. 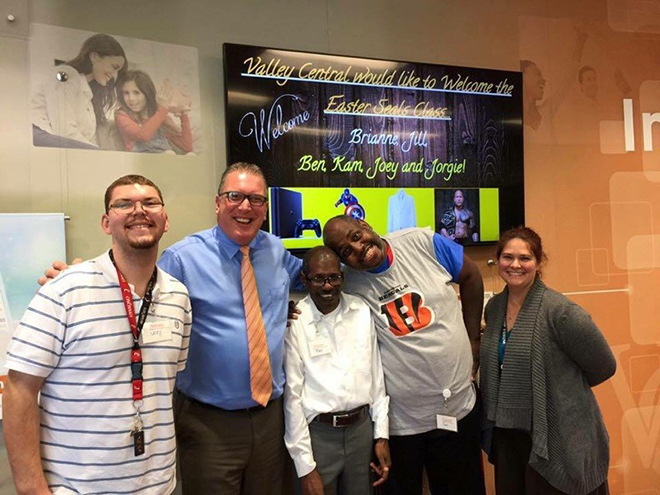 He encouraged his colleague Brad Daniels at the Valley Central Bank Reading branch to develop a similar relationship with Easterseals’ College Hill HUB; lessons began in October 2017. And Ron continues to interact with HUB participants in the community, greeting them warmly and remembering everyone’s name and interests. We assured him that he is an inspiring example of how just one individual can make great strides in creating an inclusive community, making a profound and positive difference in people’s lives every day. That is heroic.